Loyal coding wizard. She supports Michael in the code department. 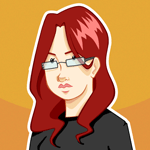 She works closely with the Gamedesign department on all the features of the player. Every day she travels through storm and snow to our office. As weird and strange the change-requests by our Gamedesigners may are, she gets them done. Rika was on board from the beginning of Klonk Games. Back in the day, when we did not even know what we should call ourselves. Also, she does not like to get cold and stores a blanket next to her desk.